Outstanding comfortable chalet in the world's biggest ski area with open fireplace, internet connection and sauna, just ~250 m distance to the ski slopes of the Three Valleys. Official classification '5 red bouquetins' with the tourist office (out of 5; red meaning with extra charm). The spacious chalet is situated in the quiet hamlet of Les Ménuires-Levassaix. This chalet provides an exceptional holiday quality: skiing in one of the world's greatest areas and enjoying all the advantages of a charming authentic mountain village. The cosy dining room with open fire place is situated on the ground floor; modern, open plan kitchen. 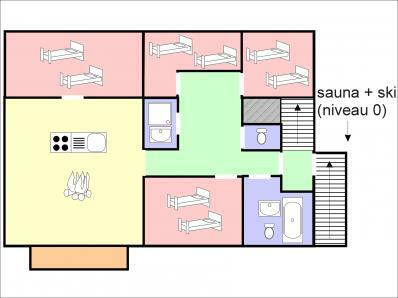 Furthermore there are four double bedrooms, one bathroom with shower, one bathroom with bathtub and WC and a separate WC. On the first floor you will find the heart of the chalet, the spacious living room with open fire place, tv and lounge. 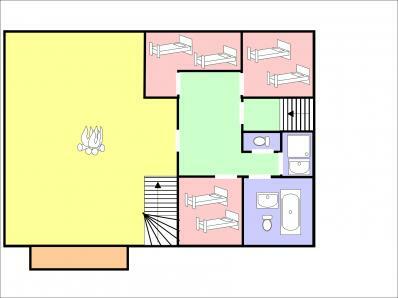 There are three double bedrooms as well as one bathroom with shower, one bathroom with bathtub and WC and a separate WC situated on this floor. On the second floor is another living room with reading corner and sofa-bed and three bedrooms, two bathrooms and another separate WC. 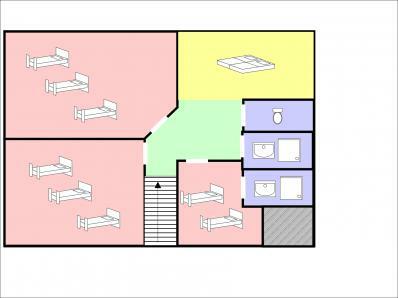 In six out of seven bedrooms the beds are flexible and can be put together or apart. Distance to the center of Les Ménuires (shopping malls, restaurants, supermarket, bars, cafés, leisure-center with swimming pool, ski school, childcare) either on ski or by ski bus (free) or by car approx. two min or ~1 km. Restaurant at 800 m, Ski and Rental shop at 500 m.
Chalet altitude ~1.750 m; top of the ski slopes 3.230 m; 600 km of alpine slopes, 172 ski lifts; the slope leading down to the chair lift of Bettaix passes the chalet (~250 m) and is prepared with snow guns. This fast 4-seater-chairlift takes you straight into the heart of the largest linked ski domain in the world. From its top, you can ski down to Les Menuires Centre on an easy slope to he meeting points of several ski schools. Thanks to this ski link, Le Bettaix is the perfect place to discover the slopes of Meribel, Courchevel and Val Thorens, too. Several ski lifts at 3,000 m, like at the glacier Peclet-Polset or the famous Cime de Caron. Ski season from approx. end of November until early may - in the sector of Val Thorens, just about 10 min by car. Whatever sportive activity you like, e.g. hiking, climbing, fishing, mountain biking or summer toboggan, you will find them all in St. Martin / Les Menuires. Some trails start right in Le Levassaix / Le Levassay. The Belleville Valley offers 250 km of hiking trails and 50 marked paths as well as guided mountain tours and two fixed rope routes („Via Ferrata“). In summer, the additional costs are included, only visitor's tax and final cleaning (see below) have to be paid on location.